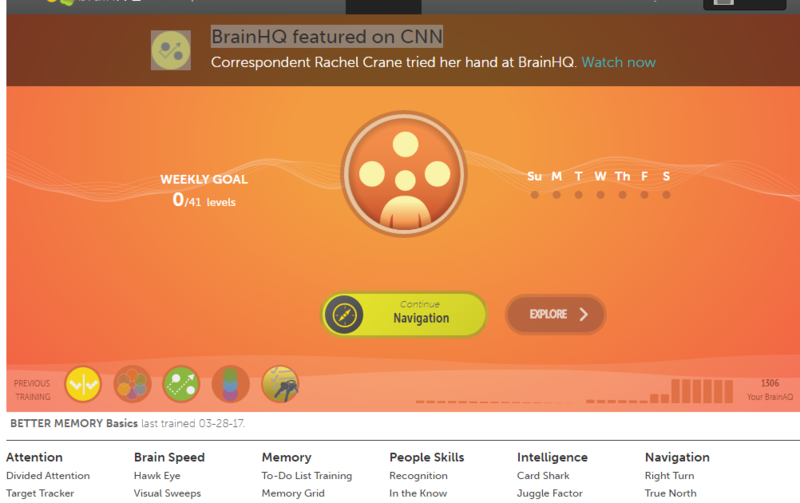 BrainHQ is a cognitive training program intended to improve cognitive performance. It is built upon the principles of “brain plasticity” – the notion that the brain is capable of continuously changing and improving. BrainHQ addresses several cognitive areas – Memory, Attention, Speed, People Skills, and Intelligence – through interactive and personally adaptive games. Developers report vast clinical research supporting BrainHQ’s efficiency. Users can choose between personalized training, courses in a desired field, or targeted exercises. At the end of each game, users receive feedback on their performance and see their cumulative score in each field. The recommended daily training time is 30 minutes, 3 times a week, although users can change the time frame according to their preferences. Easy to learn, adaptive games/ User can choose which area to focus on. Lack of motivating features/ No integrative feedback on users’ progress/ Monthly fee may be considered high. BrainHQ is an interactive and well thought out program mostly suited to people who are able to find the time and internal motivation to practice during the week. The app targets an adult to elderly population, as well as people who have experienced some sort of cognitive decline (due to injury or illness). The games are easy to learn and adapt to the user’s level of play; however, in terms of the recommendations made by the program’s personalized training, in our evaluation, there was no match between the user’s performance and the practice given by the system. There is also no integrative feedback on users’ progress and areas of improvement. (It is worth noting that the free trial does not represent the program well compared to the paid version). As with all cognitive training programs, BrainHQ is based on the notion that cognitive training in areas of difficulty can slow down cognitive deterioration or improve performance. Although some research has shown a link between the practice of specific cognitive tasks and the improvement or slow of decline in deteriorated functions (like memory, driving, etc. ), the current cumulative knowledge in the field of cognitive training does not match the extent of knowledge in other treatment orientations that target other clinical aims (e.g., CBT for depression). In addition, the ability of cognitive training to partly rehabilitate or slow down cognitive impairments related to specific illnesses – such as schizophrenia and Alzheimer’s – is still being evaluated. Therefore, users should be aware of these limitations when utilizing the program. BrainHQ could be used as a supplement to treatment for patients looking for cognitive training. Clinicians might want to consider and examine such program’s applicability for elderly patients, people at risk for cognitive decline, or people with conditions that may affect their cognition (e.g., schizophrenia). The therapist can assist in providing ongoing support for the continuous use of the program.